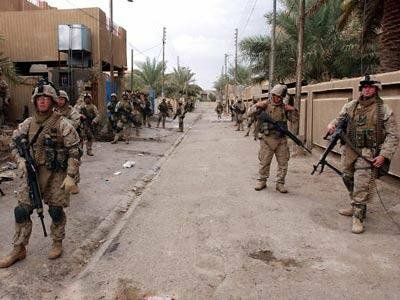 Fierce fighting is still going on in Fallujah, despite US forces having occupied the whole city. The offensive is now focused on the remaining pockets of resistance. Airstrikes, artillery and mortar rounds are being used in the southern outskirts of the city to drive rebels out of their positions and into the desert. Sky News correspondent David Chater is in Fallujah with the 1st Marine Expeditionary Force. Chater said the resistance appeared to be well-prepared, with US troops discovering many weapons caches and a network of reinforced tunnels. The interim government is hoping the offensive will help stabilise Iraq ahead of elections scheduled for January. So far 38 US soldiers have been killed and 275 wounded in the six-day assault. It is claimed up to 1,200 insurgents have also died. Elsewhere, insurgents have stepped up their attacks. :: In Baqouba, north-west of Baghdad, American aircraft retaliated by dropping two bombs, killing at least 20 insurgents. :: In the capital, Baghdad, a mortar attack killed seven Iraqis and wounded seven others, including women and children. :: In the northern city of Baiji, US helicopters fired on suspected insurgent positions following violent clashes. :: In Kirkuk, saboteurs attacked an oil pipeline, causing a huge explosion. They also set fire to a storage and pumping station. :: In the northern city of Mosul, gunmen attacked a Turkish truck and set it ablaze. The fate of the driver is unknown.